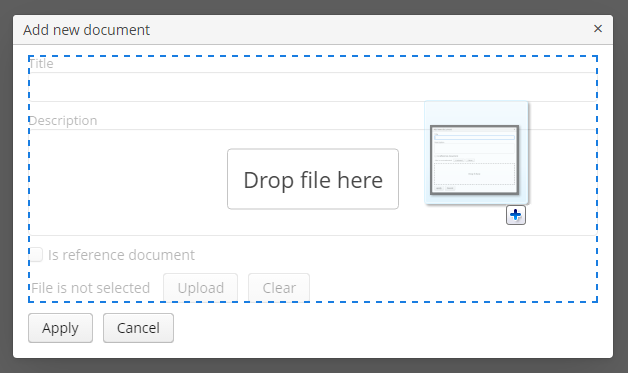 The FileUploadField component allows a user to upload files to the server. The component can contain a caption, a link to uploaded file, and two buttons: for uploading and for clearing the selected file. 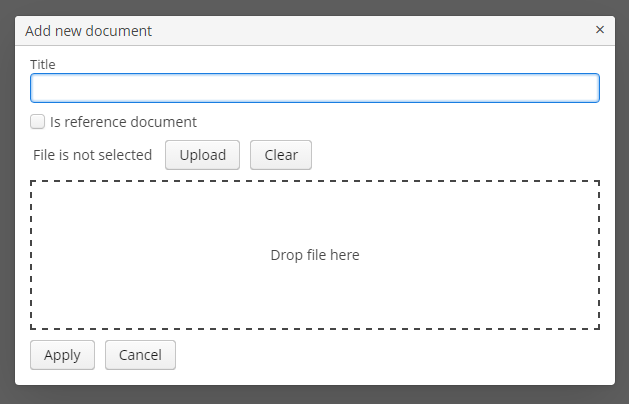 When the upload button is clicked, a standard OS file picker window is shown, where the user can select a file. 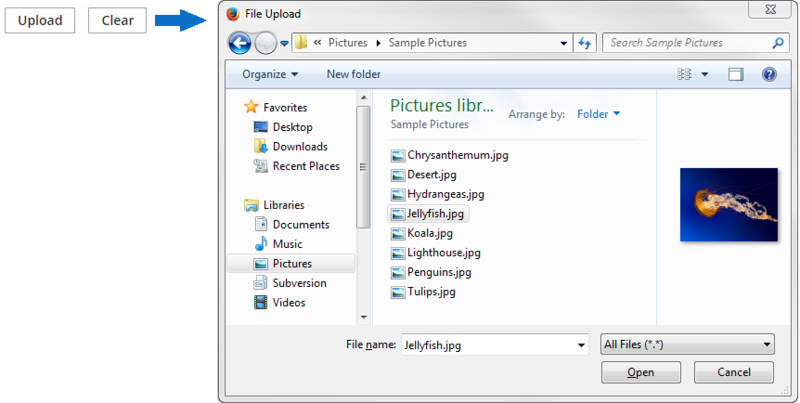 In order to upload multiple files, use FileMultiUploadField. XML name of the component: upload. For entity attributes of FileDescriptor type, the component can be used inside FieldGroup with datasource attribute, inside Form with dataContainer attribute, or independently. If the component is bound to any data component, the uploaded file is immediately stored in file storage and the corresponding FileDescriptor instance is saved to the database. 1 Here you can get the file uploaded to the temporary storage if you need it. 2 Normally, you would want to save the file to the file storage of the middle tier. 3 Save file to FileStorage. 4 Save file descriptor to database. The component will upload the file to the temporary storage of the client tier and invoke the listener added by the addFileUploadSucceedListener() method. In this listener, a FileDescriptor object is requested from the component. com.haulmont.cuba.core.entity.FileDescriptor is a persistent entity, which uniquely identifies an uploaded file and is used to download the file from the system. FileUploadingAPI.putFileIntoStorage() method is used to move the uploaded file from the temporary client storage to FileStorage. Parameters of this method are temporary storage file identifier and the FileDescriptor object. Both of these parameters are provided by FileUploadField. After uploading the file to FileStorage, the FileDescriptor instance is saved in the database by invoking DataSupplier.commit(). The saved instance returned by this method can be set to an attribute of an entity related to this file. Here, FileDescriptor is simply stored in the database. The file will be available through the Administration > External Files screen. The listener added by the addFileUploadErrorListener() method will be invoked if an error occurs when uploading a file to the temporary storage of the client tier. fileStoragePutMode - defines how the file and the corresponding FileDescriptor are stored. In the IMMEDIATE mode it is done right after uploading file to the temporary storage of the client tier. In the MANUAL mode, you should do it programmatically in a FileUploadSucceedListener. The IMMEDIATE mode is selected by default when FileUploadField is used inside FieldGroup. Otherwise, the default mode is MANUAL. uploadButtonCaption, uploadButtonIcon and uploadButtonDescription XML attributes allow you to set the properties of the upload button. showFileName - controls whether the name of uploaded file is displayed next to upload button. It is false by default. showClearButton - controls whether the clear button is visible. It is false by default. clearButtonCaption, clearButtonIcon and clearButtonDescription XML attributes allow you to set the properties of the clear button if it is visible. The fileSizeLimit XML attribute (and the corresponding setFileSizeLimit() method) can be used to set maximum allowed file size specified in bytes. dropZone - allows you to specify a BoxLayout to be used as a target for drag-and-dropping files from outside of the browser. The dropZone can cover the whole layout of a dialog window. The selected container is highlighted when a user drags a file over the container, otherwise it is not visible. pasteZone allows you to specify a container to be used for handling paste shortcuts when a text input field nested in this container is focused. This feature is supported by Chromium-based browsers.